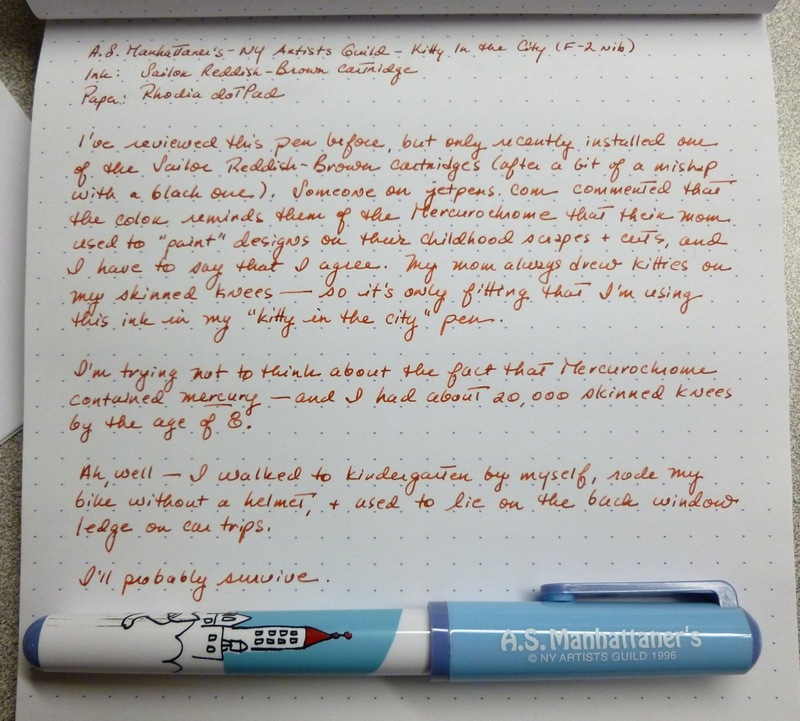 Flashback #1: I’ve reviewed this pen before, and in that review, recounted how I’d ALMOST sold this pen because I couldn’t get it to write consistently. But I mucked through, and gave the pen one more chance. It must’ve heard my threat, because it’s been fine ever since. 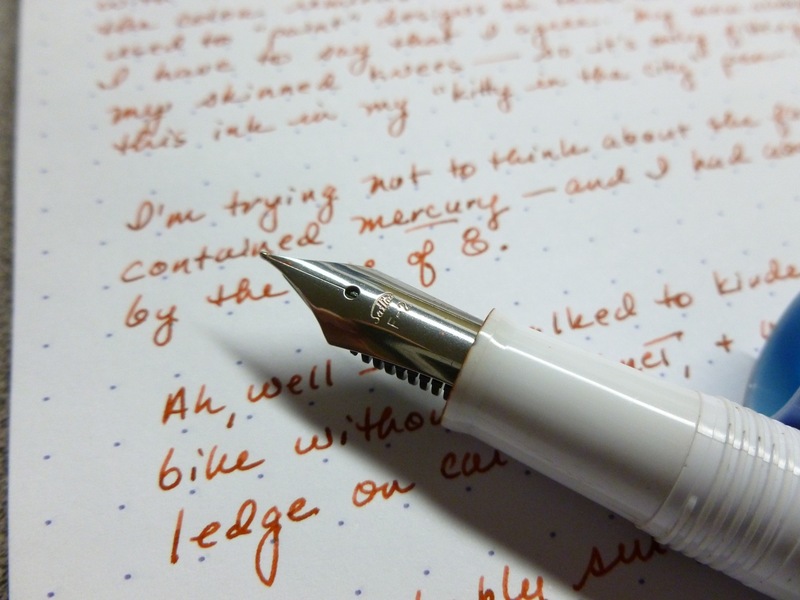 It’s fine in that it writes a very fine line, and fine in that it writes when I need it to. So why review again? Well, I had a bit of an ink issue…black ink splooched into the cap for no apparent reason (maybe it went on an airplane without me?? )…so I gave the pen a good clean-out. 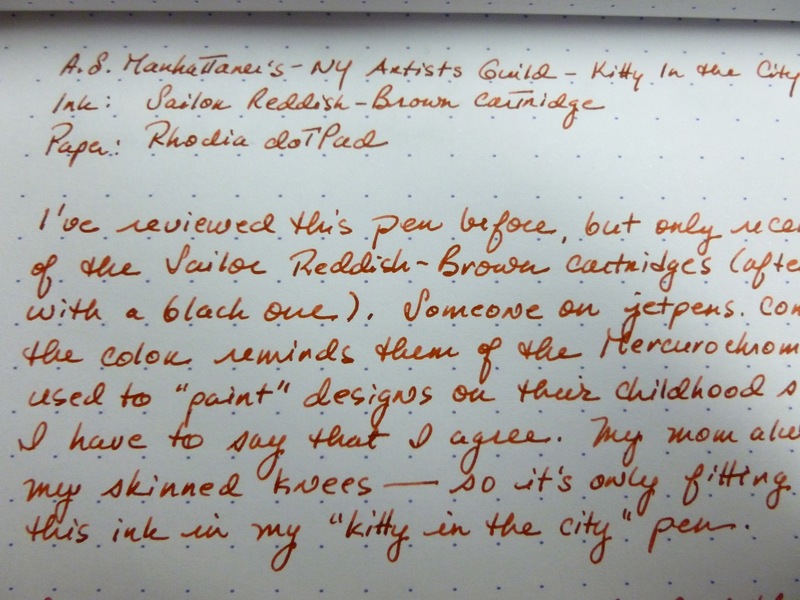 After letting it dry, I decided to pop in one of Sailor’s Reddish Brown cartridges that I have on hand but have never used. LOVE the color, which really IS reddish brown…or maybe orangeish brown. It reminds me of J. Herbin’s 1670 Rouge Hematite, but without the sediment. Because I’m using it in a pen with a very fine nib, the shading isn’t as apparent as it may be otherwise, but it is there nonetheless, and I really like the look. I’m enjoying it enough to break out of my usual black ink rut and have been using this pen and ink to write my incessant lists (groceries, to-dos, Christmas stuff…) and find that my lists as least LOOK a lot more fun. Flashback #2: I read a review somewhere, maybe on JetPens, where the reviewer noted that the ink color reminded them of the Mercurochrome that their mother used to draw on their little kid scrapes and cuts. WOAH…Mercurochrome! Hadn’t thought about that for years! My mom used it to draw kitties on our constantly skinned knees. 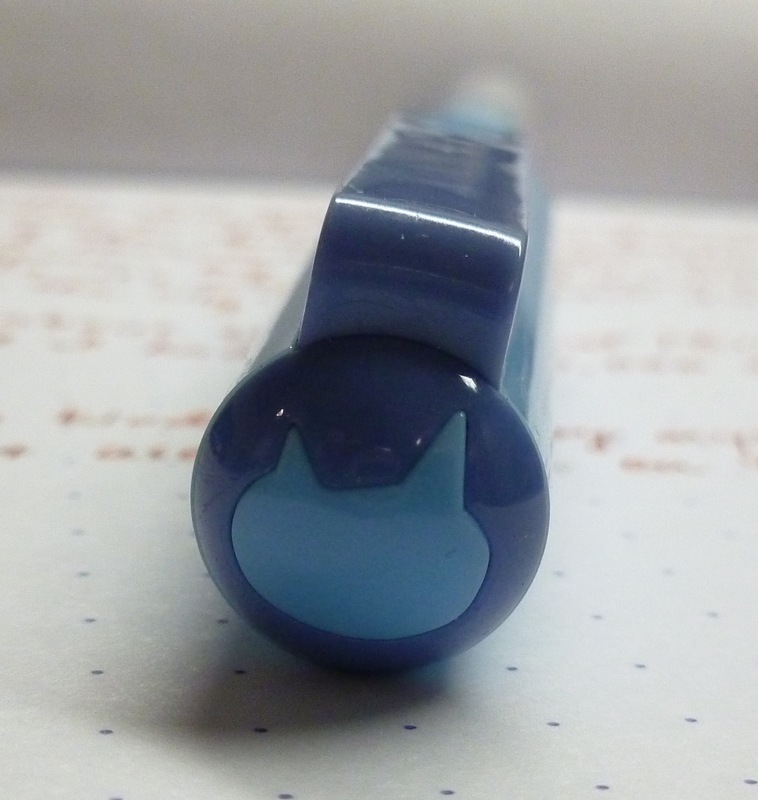 So it’s fitting that I’m using this “Mercurochrome” colored ink in a pen with a kitty on it. A quick Google search revealed that Mercurochrome was, of course, made with MERCURY. Eek. I’m trying not to think about the fact that I had 20,000 skinned knees by the time I was eight. Ah, well— I walked to kindergarten by myself (“Be careful crossing that busy road! !”), rode my bike without a helmet (sometimes “no-handed”), and spent road trips on the ledge under the back window of the family sedan (what seat belts?!). I’m sure I’ll survive. Unfortunately, the A.S. Manhattaner “kitty” pens are no longer available (there were a number of different motifs, all featuring a cat), but Sailor’s Clear Candy pens appear to be virtually the same. 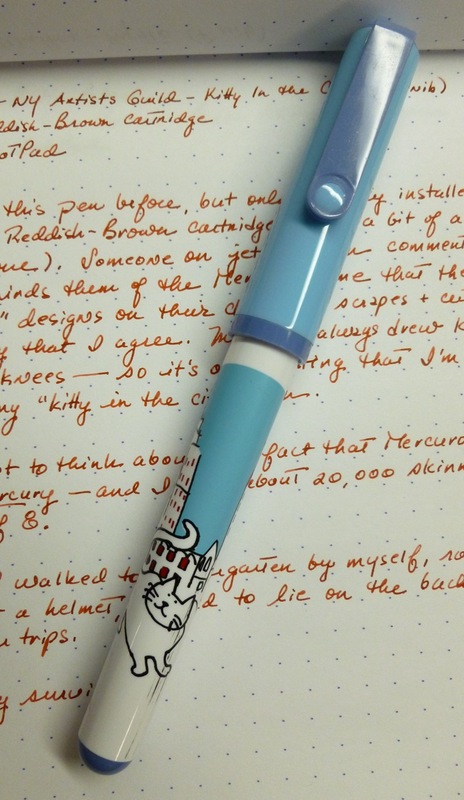 The nib is certainly no-frills, but I can vouch for the very crisp line that it lays down. Its reasonable price and range of fun colors makes Sailor’s Clear Candy a good “starter pen” candidate, especially for kids, or for anyone looking to add a little color to their fountain pen collection without breaking the bank. Who needs a fancy nib? Though I was already having fun with this pen, I’m enjoying it a little more with the new ink color. And the reddish brown ink brought back a flood of childhood memories. There’s no telling where a pen and ink can take you.